A district judge in Londonderry has described Brexit as an "abominable exercise in misgovernment". Barney McElholm made the comments during the bail application of a man who lives in the Republic of Ireland. 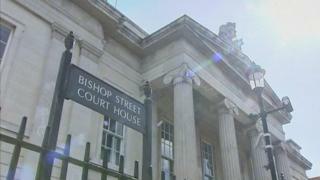 John Paul McGowan, 32, from Moville in County Donegal, had been extradited to appear before Londonderry Magistrates Court on Thursday. Mr McElholm said continued uncertainty could impact on current cross border extradition laws. He told the court: "We are nearly three years down the line and still nobody has even a sketch of a plan. "It would suggest little optimism at the moment that some agreed way forward is going to be reached. "We could even have the situation arise where anyone living in the Republic of Ireland will not be subject to the extradition laws of this jurisdiction," he added. The defendant previously skipped bail in 2015. He is charged with unlawfully fighting and affray. Mr McGowan proposed a bail address in Moville, but was refused bail.